Bruno Cidra’s current solo show is titled “Flecha,” Portuguese engineering jargon for “deflection”—that is, the degree a steel beam can be bent under tension. Cidra’s sculptures play with the limits of this idea, experimenting with and frequently intensifying it. Untitled (arrow), 2012, for instance, is a product of extensive research Cidra conducted to find the exact point where a beam of steel and paper would deflect—which it does at five feet and six inches—and naturally curve against the wall. 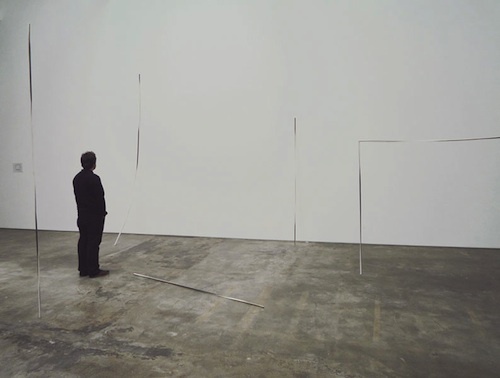 He applied the same process to Untitled (vertical), 2012, cutting a similar beam until it was able to stand on its own without falling or bending. As is recurrent in his practice, Cidra both contradicts and explores the inherent characteristics of his elected material—steel—almost as if it were as malleable as clay or paper. Its innate rigidity is countered by the deformations Cidra imposes, while its strength is made fragile by the folds inflicted on the beam. Nine sculptures are on view here, each based around a simple structure: a narrow beam upon which several layers of thick white drawing paper are glued. Throughout the span of each piece, Cidra forces the steel into several torsions, causing the work to become a three-dimensional line intercutting space. The white of paper fades against the gallery walls, enhancing the texture and color of the beam, while the twists of steel make the sculptures seem perpetually in motion—at times seeming to disappear or become black lines, much like stripes of marker on a sheet of paper.